The problem with today’s typical filtration systems is that the critical particles that can have a negative effect on the health of human beings never actually get to the systems filtration banks! This is a common and misunderstood fact about filtration systems. Unfortunately, the market has provided devices that are mostly substandard and only partially deliver the performance and benefits that are advertised. As previously mentioned, “the ACS is the only system” that utilizes Active Particle Control, which actually controls the movement of particles in a space. This Technology provides the ability to treat all airborne challenges (Particles, TVOC’s, Smoke, Odors and dissolved gases) the same. Active Particle Control provides the ability to make airflow the dominant transport mechanism for airborne pathogens and contaminants in any space. Provides MERV 15 Filtration Efficiency at low static pressures. Provides Airborne Pathogen inactivation thru our INACTIVATE Technology. Proven to effectively reduce airborne contamination levels including particles, TVOC’s, smoke, odors, CO, CO2 and dissolved gases. Proven to reduce Fan Energy and Brake Horse Power in Air Handling Units. 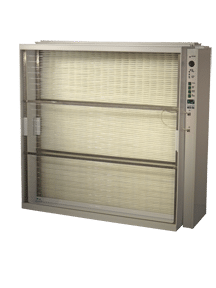 Airborne Pathogens are prevented from replication and growth inside of an Air Handling Unit.